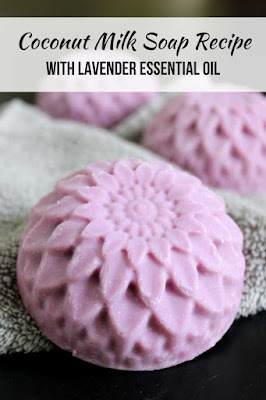 This coconut milk soap recipe with lavender essential oil from guest blogger, Rebecca D. Dillon of Soap Deli News, is an easy way to add coconut milk to your everyday beauty routine. 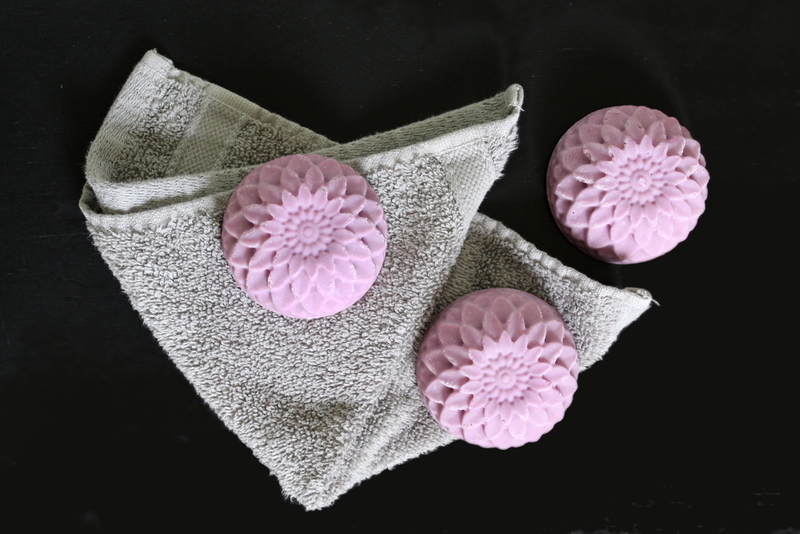 You can hunt for the perfect homemade face and body soap, but with this luxe coconut milk soap recipe you won't have to. 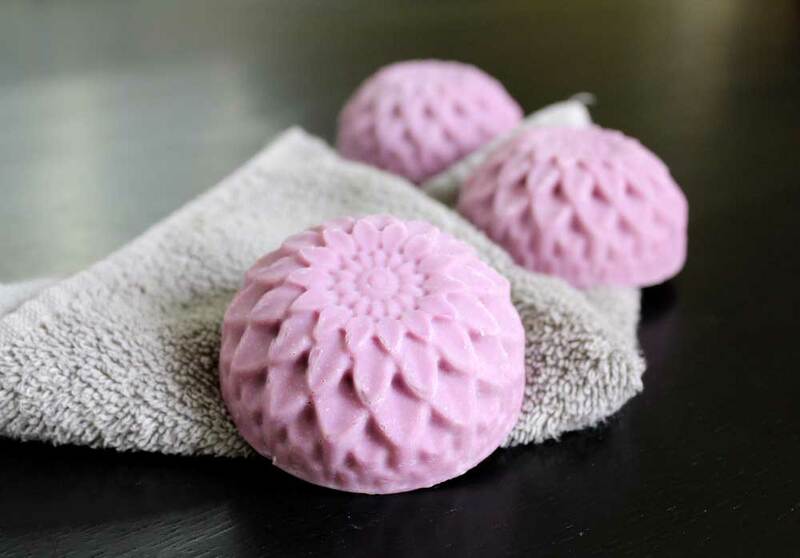 This natural homemade soap recipe is the perfect choice for dry, maturing and even sunburned skin. And with warmer weather on the way, you don't want to skimp out on the best moisturizing body bar possible. Coconut milk offers a variety of skin care benefits. Adding it to my coconut milk soap recipe is an easy, natural way to take advantage of its skin care benefits on a daily basis. Created by straining coconut meat blended with water, coconut milk is rich in vitamins and fatty acids that skin loves. It's also a wonderful natural moisturizer when used on both skin and hair both in soap or by itself. Coconut milk's natural antibacterial properties mean it's also useful at preventing or treating acne. While the high concentration of vitamin C and copper lend their anti-aging properties. I also love coconut milk for soothing sunburns as well as to moisturize my own often dry and maturing skin. If the skin care benefits of coconut milk sound perfect for your skin type, then you'll love my natural coconut milk soap recipe with lavender essential oil. Because both dry and maturing skin need maximum moisture, I formulated my coconut milk soap recipe with skin conditioning carrier oils like chia seed oil, shea nut oil and walnut oil. While chia seed oil isn't as commonly used in soapmaking recipes as other carrier oils, it's definitely one to consider more often. Rich in essential fatty acids, powerful antioxidants and phytonutrients that are prized in anti-aging skin care products, chia seed oil really helps to create a luxe soap that's suitable both for both your face and body. Shea nut oil, also known as fractionated shea butter, and walnut oil also lend their own moisturizing and skin soothing properties to this coconut enriched beauty bar. Like my milk and egg sea salt shampoo bar recipe with ginger essential oil that I shared recently on my own blog, Soap Deli News, the coconut milk for my coconut milk soap recipe must be chilled prior to use. To do this, simply measure out the coconut milk called for in the recipe in fluid ounces into a heat safe, non-aluminum container and freeze until a thin layer of ice forms on top. Then mix briefly until slushy. While you are waiting for your coconut milk to chill, collect all of the other soapmaking ingredients and equipment you’ll need for making my coconut milk soap recipe. This includes proper eye protection, long sleeved clothing and gloves. Additionally you should also double check any containers you are using to be sure they are heat safe. None of your equipment, containers or your utensils used for soapmaking should be aluminum. Stick to stainless steel, Type 5 polypropylene plastic and tempered glass. 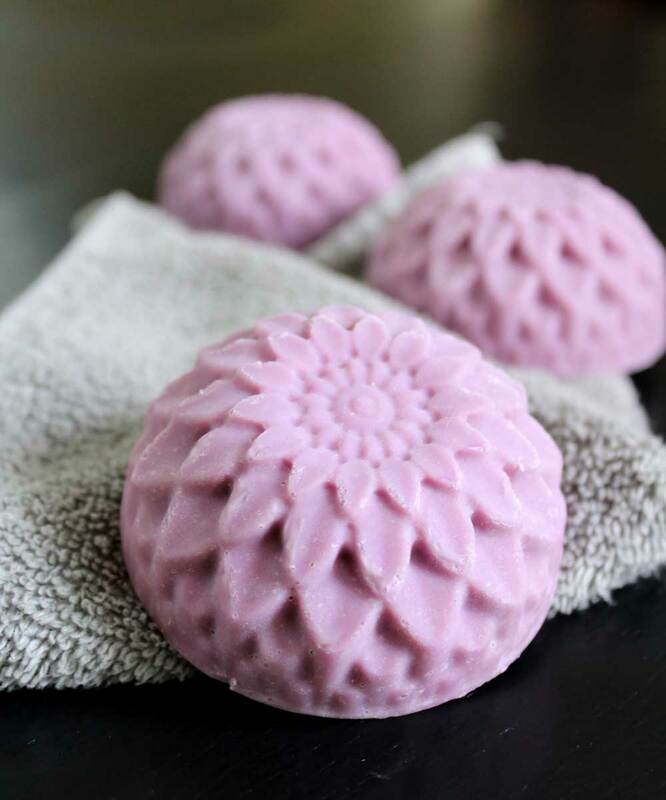 If you’ve never made homemade soap before, I recommend reviewing my cold process soapmaking tutorial before getting started. 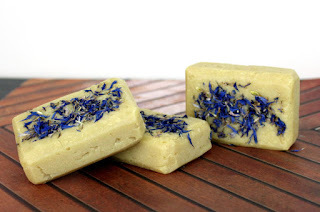 This will help you gain a better understanding of the process as well as help you determine you'll be comfortable making my lavender and coconut milk soap recipe as your first batch of cold process soap. Once the coconut milk is slushy/icy you're ready to begin. 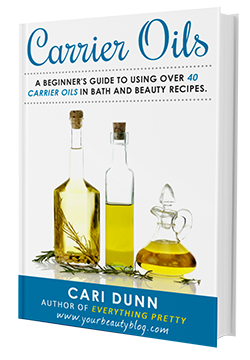 Start by using a digital scale to weigh out the soapmaking oils into a heat safe container. Then, depending on the container used, either heat the oil until melted at reduced power in the microwave, in a double boiler or over medium-low heat on the stovetop. In a separate container, weigh out the lye called for in my coconut milk soap recipe. Pour the lye into the cold coconut milk and then stir until all the lye has dissolved. Set aside. 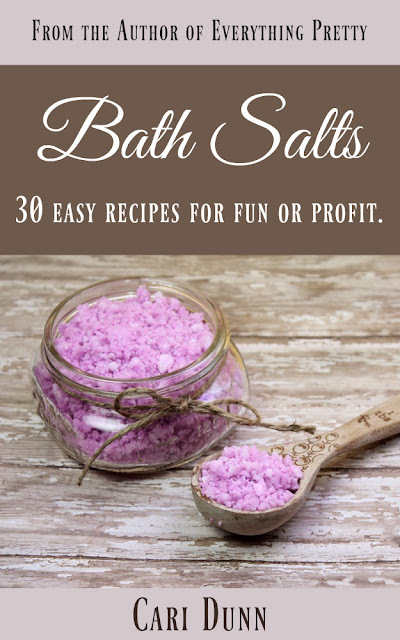 In the interim, measure out the Himalayan pink salt and purple mica (for color if desired) and weigh out the essential oils. Once both the coconut milk/lye mixture and the soapmaking oils have both cooled to around 90°F, you are ready to make soap. Add the salt to the coconut milk/lye mixture and stir. Then, add the mica to your soapmaking oils and mix briefly using an immersion blender. Now slowly pour the coconut milk and lye mixture into the liquid soapmaking oils. Mix using the immersion blender until reach a light trace then add the essential oils you weighed out previously. Continue mixing your coconut milk soap batter until you reach about a medium trace. Set your mold onto a cutting board, then pour evenly into each of your mold’s six cavities. 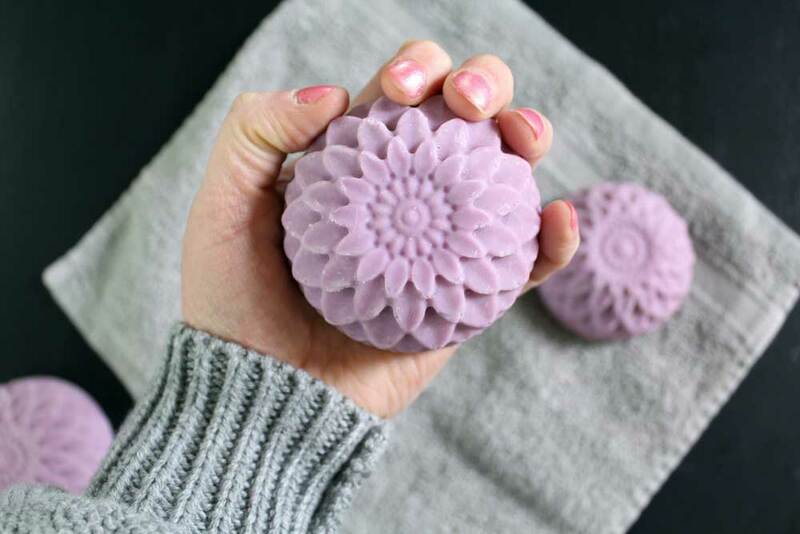 I used this silicone chrysanthemum mold for my lavender and coconut milk soap recipe. With a cutting board under your mold, gently pick up the cutting board and the mold together and tap lightly on the counter several times. This will help release any air bubbles that may be present in the soap. Alternately, I also offer several other coconut milk recipes that you can try. If you're not quite ready to make my coconut milk soap recipe, you can buy similar soaps instead! Each of these handmade artisan coconut milk soaps are a dream and can help to improve skin texture and promote skin health. 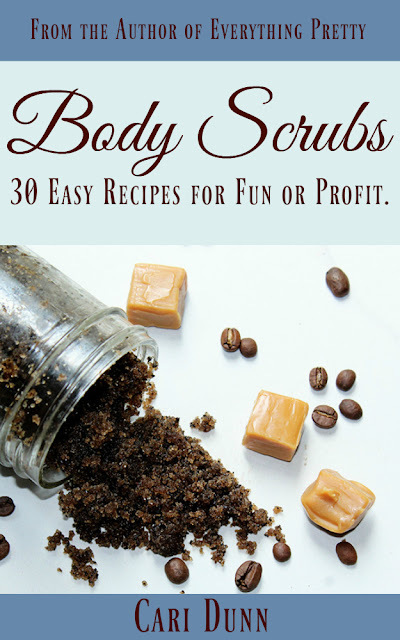 You can discover more of my homemade soap, bath, body and beauty recipes at Soap Deli News blog. 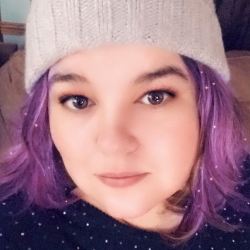 Or follow me on all of your favorite social media platforms including G+, Tumblr, Facebook, Twitter, and Instagram. 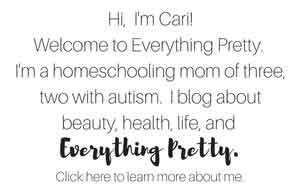 Don't want to miss a post? Subscribe to Soap Deli News via email for future updates, DIY projects and recipes.